For 2018, we are lighting up your summer nights! The Brookgreen Summer Lights Festival launches on May 24 and runs Wednesday - Saturdays nights through August 19. During the Festival, Brookgreen will close at 5:00 pm. and gates will re-open at 6:30 pm. Festival hours are 7:00 pm - 10:00 pm. 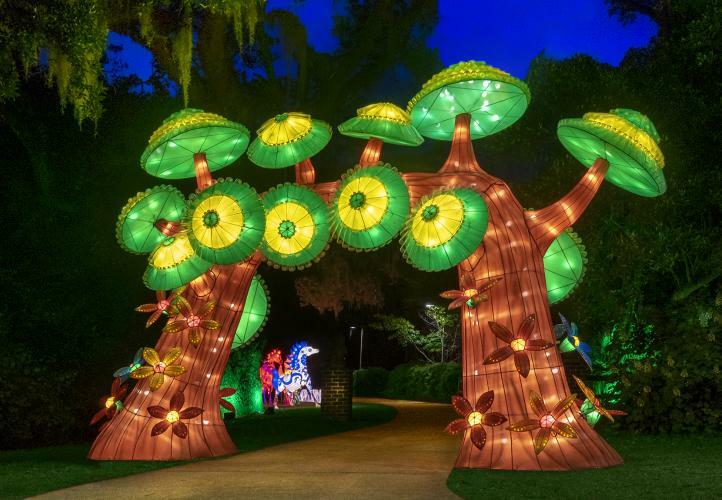 Created by Chinese Craftsmen in the tradition of famous Chinese Lantern Festivals, this exhibit will inhabit our Lowcountry Zoo with larger-than-life, illuminated silk lantern sculptures in a variety of native animals, insects and plants. The festival will also include activities, music, Chinese paper crafts, Chinese horoscopes and more. Local food truck vendors will be on hand with a variety of dinner and snack options. Dinner, snacks, refreshments and adult beverages available for purchase during the festival. Tickets are $20.00 for adults and $12.00 for children 4 - 12. Children 3 and under are free. Members receive a $5.00 discount on the ticket price. Tickets must be purchased BEFORE your arrival! Space is limited. Tickets are non-refundable. Tickets may be exchanged for another night based on availability by calling 1-(888) 718-4253. The deadline to request an exchange is 3 p.m. on the date of your ticket. The trail through the zoo is approximately 1 mile. For those who may have difficulty walking we offer push behind adult strollers for free on a first-come first-serve basis. The adult strollers are not meant to replace a wheelchair, they are simply to be assistance for those who may need help walking the distances necessary to fully experience Brookgreen Gardens. They will not fit into our handicapped accessable restrooms due to their size. Guests who require a wheelchair or other mobility equipment should bring their own.